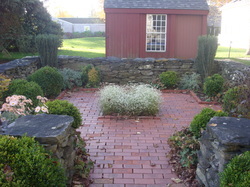 The United Congregational Church invites its members and friends to be a part of the Memorial Garden located between the Parsonage and the Parish House. Each 4” x 8” brick will cost $100 and can be engraved with 1, 2, or 3 lines. All proceeds raised from this project will go directly to the United Congregational Church Endowment Fund. All donations are 100% tax deductible. In addition, you are encouraged to write a one-page biography of your loved ones, which will be entered in our Memorial Garden Album. There must be one order form for each brick ordered. If you would like to order a brick, please click on, print out and complete the brick order form attached below and return to the church office.